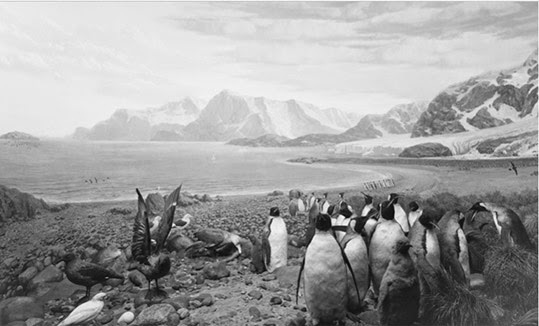 Still-Life (21 November 2014 – 24 January 2015) at Pace Gallery in London’s Mayfair district features black and white photography by Hiroshi Sugimoto (b. Tokyo, Japan, 1948). 13 large format works forming part of the artist’s ongoing - four decade long - Diorama series are displayed in a spacious room and the focus is the natural world. 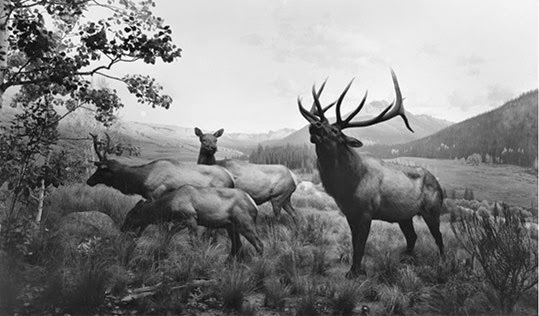 Sugimoto’s lens captures flora and fauna in a manner that makes nature appear both physically static and timeless. 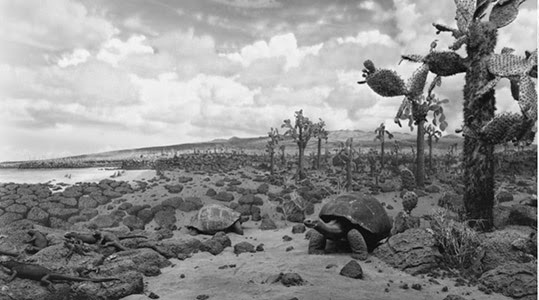 Photographs of dioramas found in natural history museums, the images play with the viewer's perception of reality as well as photography's supposed objectivity. As Sugimoto reveals on his own website: "Upon first arriving in New York in 1974, I did the tourist thing. Eventually I visited the Natural History Museum, where I made a curious discovery: the stuffed animals positioned before painted backdrops looked utterly fake, yet by taking a quick peek with one eye closed, all perspective vanished, and suddenly they looked very real. I'd found a way to see the world as a camera does. However fake the subject, once photographed, it's as good as real." As such, the works' artificiality also serves as an exploration of nature as mediated through the museum. With some of the world's natural habitats being destroyed and many species becoming endangered or on the verge of extinction, the concepts of memory and preservation also come to the fore. The central piece, Olympic Rainforest, a vast image of trees and assorted plant life with "sunlight" in the distance, makes visitors feel as though they are stepping into nature itself. Due to the work’s ample dimensions, it had to be printed in four parts and put together later. Unlike Olympic Rainforest, Birds of South Georgia and Galapagos include animals – penguins and giant tortoises respectively. Although nature is depicted as fragile, the terrain and animals appear to coexist in perfect harmony. Here too, given the size of the works, viewers can momentarily transport themselves into the scenes - breathing in the fresh sea air and viewing the animals up close. 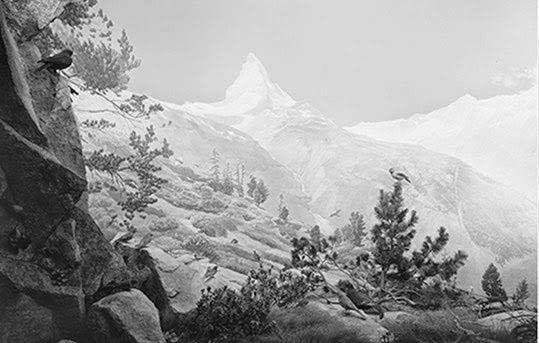 unlike Ansel Adams, who created crisp black and white photographs of nature, the rather more poetic scenes, softer focus and artificiality of Sugimoto’s works, infuse the Diorama series with an almost painterly quality, a result of the brushstrokes in the backdrops of the dioramas. The images provide a moment of peace and quiet contemplation in an otherwise hectic city. For this reason, I will be back at Pace to enjoy these photographs once again and appreciate their stillness. The fact that they can be perceived as deceptive simply adds to their beauty.